Patriot Pest Control has been your central Georgia pest control partner since 1991. Our longevity means we know middle Georgia, and we know the pests that thrive in our Georgia climate—termites, ants, roaches, fleas, silverfish and more. We customize our treatment to help you rid your life of these pests now, and prevent them from coming back in the future. You can trust Patriot Pest Control to ensure a healthy environment for your family or business. We take seriously our mission to bring you the highest possible level of professionalism and client satisfaction. Since 2003, company founder Steve Hall has served as District Adviser to the Certified Pest Control Operators of Georgia (CPCO). Our long-time involvement in industry organizations means we immerse ourselves in the latest cutting-edge information and best practices. We put that knowledge to work for you. 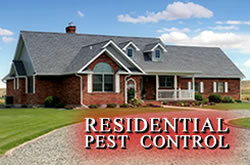 Residential or commercial, Patriot Pest Control rids your life of nuisance and harmful pests. We specialize in eliminating pests in central Georgia—call us for service throughout Butts, Coweta, Henry, Lamar, Pike, Spalding, and Troup counties. Pests in central Georgia are a constant menace to both residents and the structures they live in. Protect your family, and your home, with Patriot Pest Control’s custom designed treatments that do the job with minimal disruption to your family’s daily routine. We eliminate the pests you see, as well as the ones you don’t. Our advanced, environmentally friendly methods stop invasions at the source and wipe out the critters that are already in your home. Keep pests at bay with regular treatment. Our popular monthly and quarterly service plans stop pests before they can get a foothold in your home. Termites are perhaps the most feared of all threats to your mid Georgia structure. Termites in central Georgia are active 24 hours day, day in and day out, year around. To add to this stress, in most cases termite damage is not covered by homeowners insurance. Termites are often invisible to the untrained eye, so by the time their damage is evident it is probably too late to avoid expensive repairs. 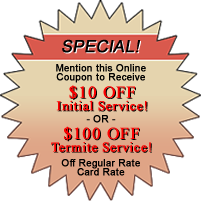 Stop termites before they reach your home or business with Patriot Pest Control’s professional treatment, proven effective by over two decades of successful termite colony elimination. Don’t let your home or business become part of the statistics—damage totaling over $2 billion annually. By starting with our free, no-obligation inspection, you’ll be armed with the knowledge you need to make an informed decision about prevention and treatment. As a business, you serve your customers with excellence. 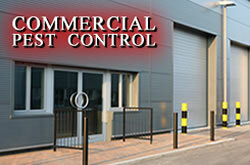 Serve them in a facility free of pests with Patriot Pest Control’s expert service tailored for your commercial needs. Businesses throughout middle Georgia battle pest invasions just like homeowners do. Our goal is for your employees and clients to experience a clean, bug-free environment. We help you protect your reputation by eliminating middle Georgia invasive pests such as roaches, ants, mice, and rats—all capable of detracting from the professional image you work so hard to cultivate. Call us today for an expert analysis of your commercial building and start on the road to a pest-free future. Copyright © 2019 Patriot Pest Control, Inc. Custom Web Design by Griffin Web Design.